To honor the centennial of Debs’ seminal speech and trial, as well as to discuss the issues involved, the Labor Education and Arts Project (LEAP) convened a Debs Centennial Commemoration on October 5-6 in Cleveland, Ohio. The Eugene V. Debs Centennial celebration/teach-in began at Cleveland State University’s Moot Courtroom on Friday morning, October 5th, 100 years after Debs gave his anti-war speech in Canton, Ohio. The first session included a panel of experts unpacking the Espionage Act, then, and now. The panelists and topics included: Ernest Freeburg, Associate Professor of History at the University of Tennessee on While there is a lower class, I am in it. ; Kevin Francis O’Neill, Associate Professor at Cleveland-Marshall College of Law gave us a Judicial Analysis of World War One Espionage Act Prosecutions; Journalist Chip Gibbons (on Skype), Legislative Counsel for Defending Rights & Dissent covered From Criminalizing War Dissenters to Silencing Whistle Blowers; and Sue Udry, Executive Director of Defending Rights & Dissent concluded with keeping the Public in the Dark: Four Case Studies on How the Espionage Act has been used to Undermine the Public’s Right to Know. The panel and Q & A were moderated by Allison Duerk, director of the Eugene V. Debs Museum in Terre Haute, Indiana. One little-known revelation was given by Sue Udry regarding Espionage Act enforcement against whistle blowers: From 1917 until 2008 there were three indictments against whistle blowers; under the Obama Administration, there were eight; under Trump, two, so far. Next was a planned tour of the “Old Courthouse,” The Howard M. Metzenbaum U.S. Courthouse, where Debs was tried and convicted in 1918. LEAP’s tour request (dated June 2017) was made to the General Services Administration (GSA), which oversees the use and maintenance of the Old Courthouse. It was referred to U.S. District Judge Patricia A. Gaughan, a Clinton appointee, who denied LEAP’s request to recite Eugene V. Debs’ courtroom speech that was delivered in that same courtroom 100 years ago. Judge Gaughan also limited the number of tour participants to 30, and all names had to be submitted beforehand. The “ceremonial courtroom,” was preserved as a historical site, “for tours like ours, you would think,” said Tom Sodders, Corresponding Secretary for LEAP. GSA typically advertises the space for wedding receptions, so Judge Gaughan’s restrictions were highly irregular. Dan Kovalik explained that the 1919 free speech case against Socialist Party state chairman Charles Schenk still denies one’s right to yell “fire” in a crowded theater, but it was Wilson who cried “fire” in a theater [Declaration of War in 1917] and it has continued ever since. Dinner meeting and Q & A were moderated by Constance Gadell-Newton, Green Party candidate for Ohio Governor. On Saturday morning, LEAP President Andrew Bonthius welcomed the group at the Louis Stokes Wing of the Cleveland Public Library. He introduced the panel: Alison Duerk with her presentation – 451 North 8th Street: The Debs House from 1890 to 2018; Ernest Freeburg: Eugene V. Debs and the Fight for Free Speech in World War One; Robert Fritakis, Political Science Professor, Columbus State Community College – The Idea of Democratic Socialism in [US]America and the Decline of the Socialist Party; and Sue Udry – The Clear and Present Danger: Attacks on the Right to Dissent, 2018. The second session: US Militarism and Its Constant Drumbeat for War was moderated by LEAP Board Member Carolyn Robb-Pavel with panelists David Goldberg, Professor Emeritus, Cleveland State University – Why Debs was Right to Oppose U.S. Entry into the Great War, Margaret Kimberly – Ending the Corporate, Military, Surveillance State and Dan Kovalik – The U.S. War Machine Versus Humanity. Our final session, “On the Question of a Progressive Political Formation Independent of the Two-Party System a la Debs,” included panelists Robert Fritakis – Debsian Politics Today; Strategies and Tactics; Margaret Kimberley – Revolutionary Politics in the 21st Century; and Nick Brana, Founder and National Director, Movement for a People’s Party – The Labor Community Campaign for an Independent Party. The Eugene V. Debs Centennial was inspirational for all involved, I am sure. 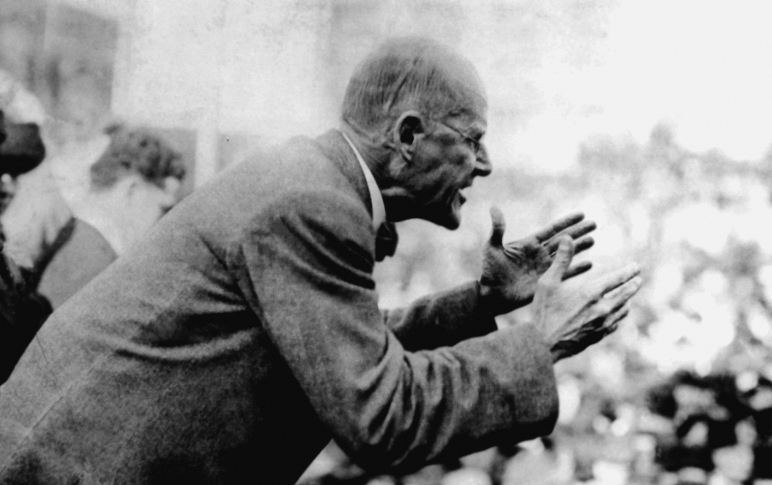 We must continue to tell the history of our rights and how free speech was actually obtained through hard-fought battles, beginning with Eugene Debs and other advocates for real democracy – socialism. I salute you for having this fitting assembly 100 years after the legendary Debs’ outstanding anti-War World I stance and famous speech – at a current time when bipartisan, endless and unjust wars for regime change line the pockets of the military industrial complex, and bring unspeakable hardships and horrors the world over. I was asked to speak on the question of “an independent political party based in the labor movement,” an issue I have been involved with for many decades, including in the Labor Party efforts under the creative leadership of Tony Mazzochi and the Oil, Chemical and Atomic Workers Union (OCAW). Let me share a few of my thoughts on this subject by quoting comments I wrote to the APWU membership before and after the 2016 election. “In addition to the traditional supporting of electoral candidates who are friends and allies of postal workers, the APWU will also pursue a strategy of advancing our core issues through referenda, initiatives and propositions at the statewide and local level; study the viability of independent and third party politics; and explore the possibility of creating a new labor-based political party, or any other reasonable means of advancing the interests of labor in electoral politics.” The APWU presented a similar resolution to the October 2017 AFL-CIO Constitutional Convention, which passed in a slightly watered-down form. Since this is a Centennial meeting of the outstanding labor leader Eugene V. Debs, let me close with two of his many great statements. Congratulations to the Labor Education and Arts Project on the momentous occasion of your Fifth LaborFest in Northeast Ohio held in commemoration of the hundredth anniversary of the prosecution of Eugene V. Debs — a very sad episode in American history. Remembering that historic event and its meaning for today’s workers is a most worthy endeavor. The corporate interests and merchants of death arrayed against Debs and against all anti-war working class leaders of the day were not only worried about the anti-war message he delivered in Canton the previous June. They were also terrified by his bold vision for building an independent working class political party. It was Debs’ broader strategy they sought to thwart and silence most. Debs, and millions of workers with him, understood that First Amendment rights were tenuous at best when it came to workers’ struggles. Throughout the trial, Debs stood forthright in his convictions, unflinching at the inevitable ruling against him and his ultimate imprisonment. true and necessary as it did one hundred years ago. On behalf of all working people, we thank you for your efforts in keeping this history alive. Debs’ relentless struggle on behalf of workers shall forever remain a shining example for humanity to follow. Unfortunately, due to other commitments we are not able to be with you in person for this wonderful event, but we will be there in spirit. We wish you great success and look forward to possible collaborations in the future. Wars throughout history have been waged for conquest and plunder. In the Middle Ages when the feudal lords who inhabited the castles whose towers may still be seen along the Rhine concluded to enlarge their domains, to increase their power, their prestige and their wealth they declared war upon one another. But they themselves did not go to war any more than the modern feudal lords, the barons of Wall Street, go to war. The feudal barons of the Middle Ages, the economic predecessors of the capitalists of our day, declared all wars. And their miserable serfs fought all the battles. … And that is war in a nutshell. The master class has always declared the wars; the subject class has always fought the battles. The master class has had all to gain and nothing to lose, while the subject class has had nothing to gain and all to lose—especially their lives. In good time we are going to sweep into power in this nation and throughout the world. We are going to destroy all enslaving and degrading capitalist institutions and re-create them as free and humanizing institutions. … We need industrial and social builders. We Socialists are the builders of the beautiful world that is to be. … In due time the hour will strike and this great cause triumphant — the greatest in history — will proclaim the emancipation of the working class and the brotherhood of all mankind. I never so clearly comprehended as now the great struggle between the powers of greed and exploitation on the one hand and upon the other the rising hosts of industrial freedom and social justice.